It snowed in Corpus Christi, Tx. We are keeping our ground covered and planting intensely and diversely. We use no till or very minimal low till. As a small fruit, small farm, in Pickens county SC we are being impacted by climate change. I/we have spent several years studying the issue and have an adaptation and mitigation plan for our farm (www.thehappyberry.com under carbon). At the core of this plan are three principles. They are perennialization, biomass storage, and returning carbon to the soil (as char from a farms waste stream) to promote soil health, absorptive capacity , infiltration rate, cation and lastly anion exchange. There is a lot “between the cup and lip” in this plan and our land grant Has been unable to help us. Anecdotally, our more heavily cover cropped fields seem to drain better and also hold more moisture, which gives us a bit more flexibility on planting date compared to neighbors. Less stuck tractors! Yes massive amounts of drainage tile and effect water flow patterns, but 99% of the time they reduce flooding and erosion due to deluges from rain because they effectively “wring out the sponge” If the soil is fully saturated when a rain event occurs almost all of that new rain will run right off of the surface. When a field has adequate subsoil drainage (especially if it is coupled with cover crops/ improved OM and soil structure) the water infiltration rate is improved exponentially. 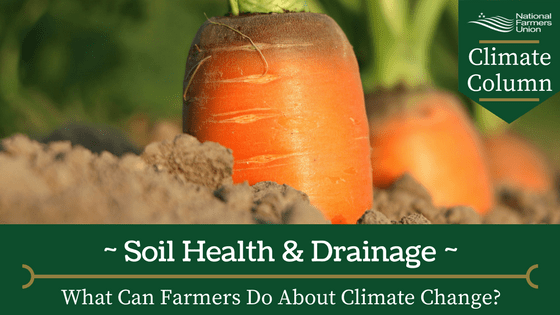 Also subsoil drainage improves the depth of root penetration especially in permaculture such as orchards and vineyards which drastically helps protect the plants from droughts later in the year as the water table drops the roots are already deep. Diversion ditches on the other hand can be dangerous in terms of virtually unlimited runoff overflowing streams during a deluge… The nice thing about drainage tile is that they slowly and consistently drain excess water out of the soil. The key it to have improved OM in the soil to help hold more available water in the soil for your crops.